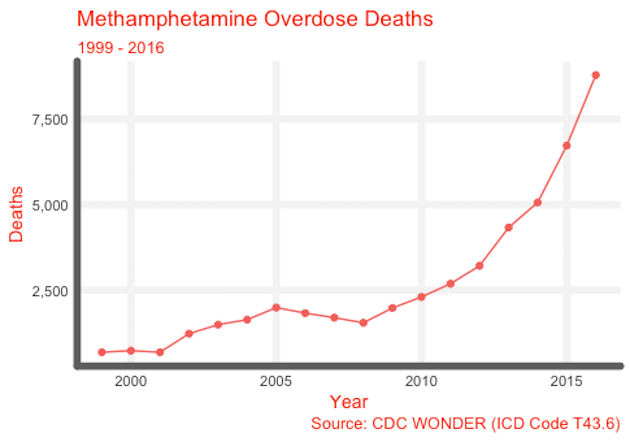 An analysis conducted by the Free Beacon, based on publicly available data, shows that meth-associated overdose deaths rose more than 450 percent between 2008—the trough of the last meth crisis—and 2016. 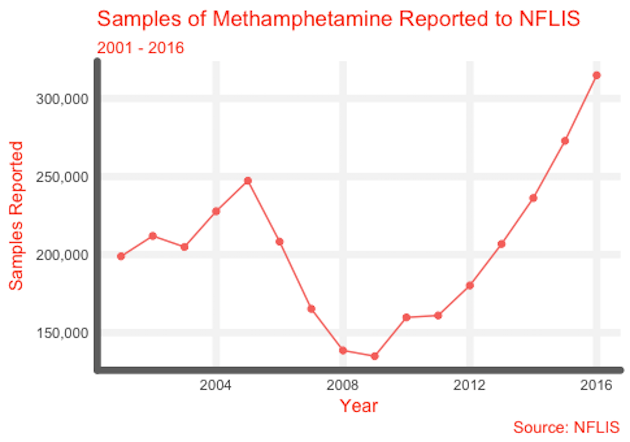 According to the Drug Enforcement Administration and the Free Beacon’s analysis, that spike was instigated not by domestically produced meth, but by a surge of amphetamines trafficked by Mexican cartels into the United States. This prompted action by Congress and state legislatures, leading to a reduction in meth overdose deaths over the next three years. Legislation targeted the supply of precursors, primarily the cold medication Sudafed. “Mom-and-pop” meth labs, keys actors in the crisis, were starved out of existence. 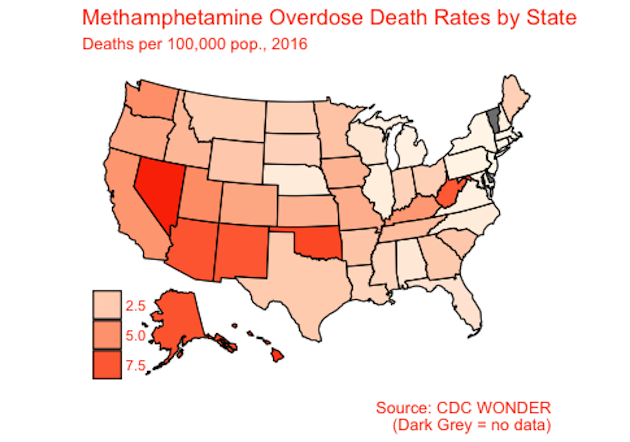 DEA field offices confirm the trend: approximately 30 percent reported in 2017 that meth is “the greatest drug threat in their areas.” The reporting offices are scattered throughout the country, but meth overdose deaths generally are highest in the southwestern states (with Alaska, Hawaii, and West Virginia, as outliers). Special Agent Kameron Korte, the Community Outreach Director of the DEA’s San Diego Division, told the Free Beacon that her office was among those where meth is the most prevalent issue. Data obtained by the Free Beacon from U.S. Customs and Border Protection (CBP) confirm that meth is instead flowing across the border. 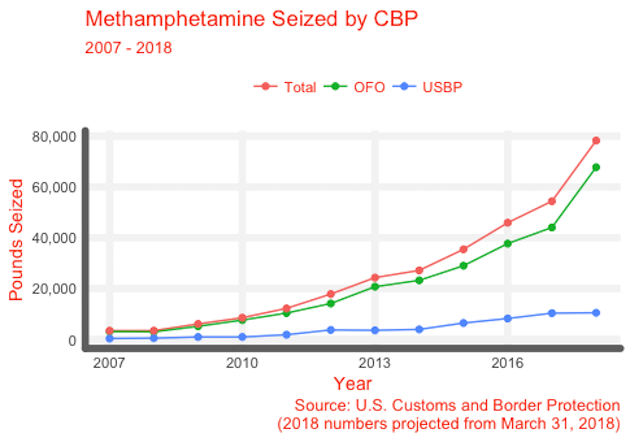 Statistics from both the U.S. Border Patrol and CBP’s Office of Field Operations—which oversees points of entry—show that the amount of interdicted methamphetamine has risen continuously since 2008. 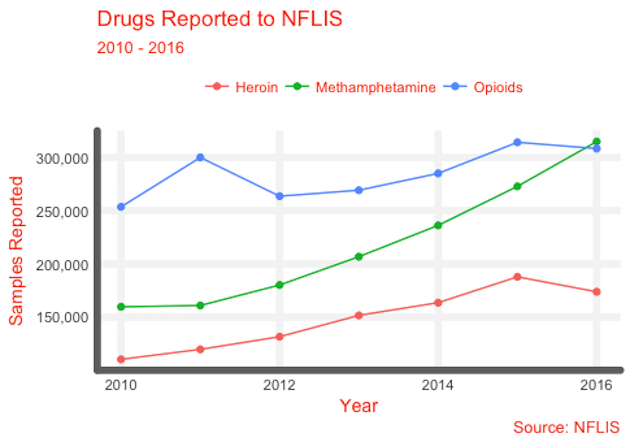 In other words: the fact that opioids are deadlier than meth does not necessarily mean that the boom in meth deaths is not worth attention, given meth’s negative impact on its users and its apparent prevalence. 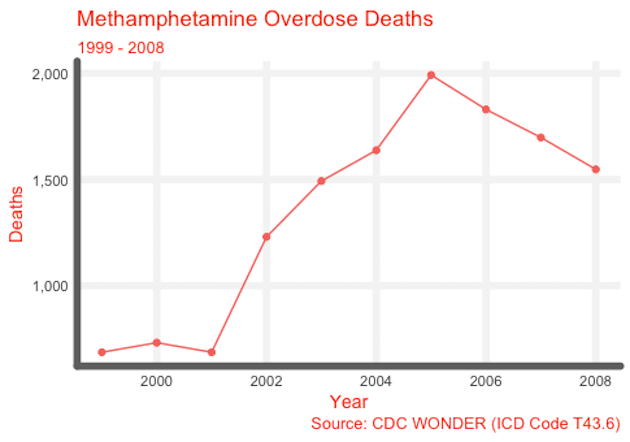 “Harm reduction responses specific to methamphetamine use could help reduce overdose deaths. Prevention policies and public health approaches could decrease the prevalence of use,” Carrie Wade, a Senior Fellow at the R Street Institute, told the Free Beacon. At the same time, law enforcement has a role to play. Williamson, the Special Agent in Charge of the El Paso Field Division, said that his office has focused its investigations on the Sinaloa cartel, which produces much of the Mexican meth. They’ve also partnered with the border patrol and state police to amp up interdiction. “Basically, it’s just aggressive investigation, aggressive enforcement,” Williamson said. The post Analysis: There Is a Meth Crisis in America appeared first on Washington Free Beacon.